Turns out hashtags were only the beginning. Now, Facebook is testing another Twitterish staple: Trending Topics. 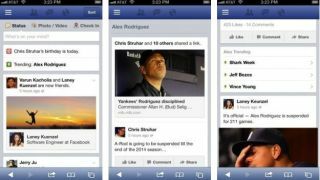 The social network is trying out a feature on its mobile site that populates a topic other Facebookers are talking about, as reported byAllThingsD. Users can click on the topic, and up will pop information from friends talking about the subject, as well as comments and posts from people they aren't friends with. Trending Topics is currently in beta testing with a small number of U.S. users, Facebook said in a statement sent to TechCrunch. The feature is in very early testing, the statement noted, and the FB team will share more "if we decide to roll it out more widely." The Facebook crew isn't just tracing Twitter's footsteps today. The company is also expanding Graph Search, launching it for anyone who has U.S. English set as their language. So if you've been dying to search for "Friends of friends who live nearby and like playing tennis," and you're a U.S. English speaker/reader/user today is your lucky day. Facebook also noted that it is starting to retire the "who can look up my timeline by name" setting. Hasta la vista, as they say. What's old is now new in the News Feed. Read on to see what we mean.